Case Studies for Organizational Communication 3 Edition Case studies offer students the opportunity to explore critical incidents and develop effective strategies for resolution. 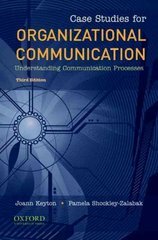 Featuring the exclusive, real-life case studies of top communication scholars, Case Studies for Organizational Communication: Understanding Communication Processes, Third Edition, employs a unique applied approach that allows students to use their knowledge of organizational communication to analyze typical organizational problems. Edited by Joann Keyton and Pamela Shockley-Zalabak, the book includes a variety of open-ended cases that encourage lively classroom discussions. This format also provides instructors with greater flexibility in connecting case assignments to their primary text. Now in its third edition, the book is enhanced by an updated companion website (www.oup.com/us/keytonshockley) featuring instructor resources and case studies from previous editions. Two new sections--"Organizations and Their Stakeholders" and "Organizational Crisis"--and twenty-one new readings address a variety of issues, including organizational technology, teamwork and group processes, decision-making and problem-solving, and diversity. A flexible supplement covering a broad range of contexts and situations, Case Studies for Organizational Communication, Third Edition, is an essential resource for helping students devise successful communication strategies.